I saw a post on FB that KU med was looking for participants in a study. 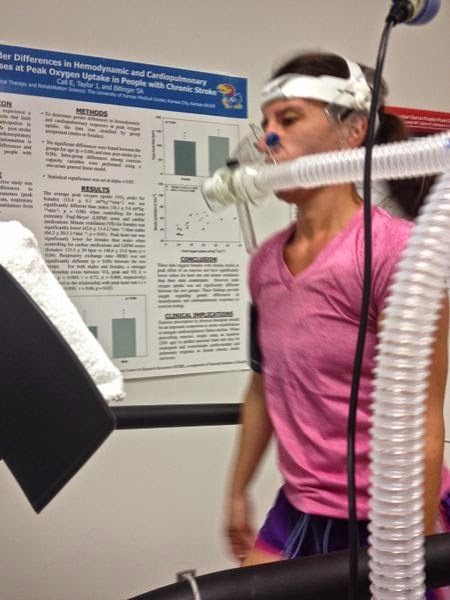 Part of the study involved having your VO2 max taken. If one wanted to have this done it would normally cost money to have done but since I agreed to be part of their research it was free. I thought it would be fun to do and wanted to know what my VO2 max was. It was kinda fun, I really know how to have a good time. VO2 max - Considered the best indicator of cardiovascular endurance, it is the maximum amount of oxygen (mL) that a person can use in one minute per kilogram of body weight. 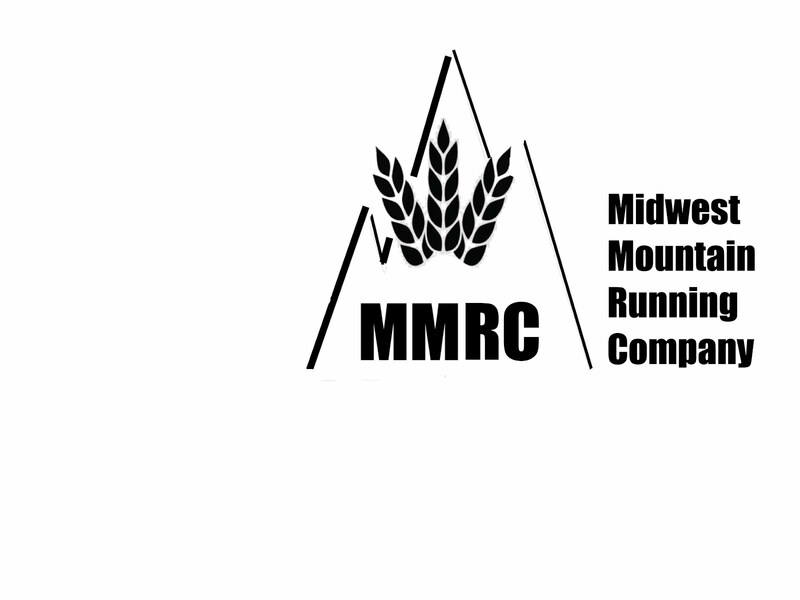 The study was to test the accuracy of a sub max test on a recumbent bike. 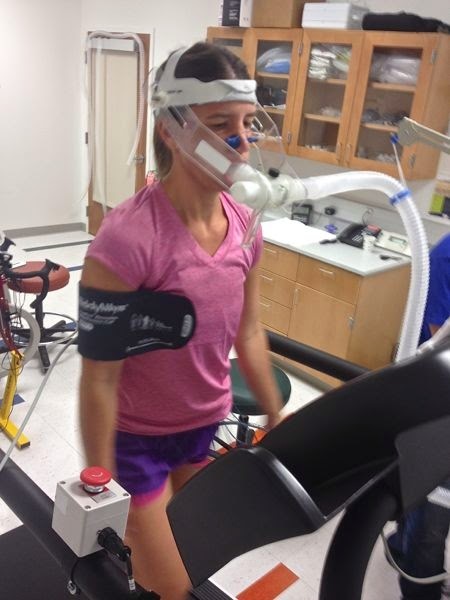 The idea being that you could predict what a stroke patient VO2 max was by doing a sub max test on a recumbent bike. First I came in on 2 separate days and did the sub max test on the recumbent bike. 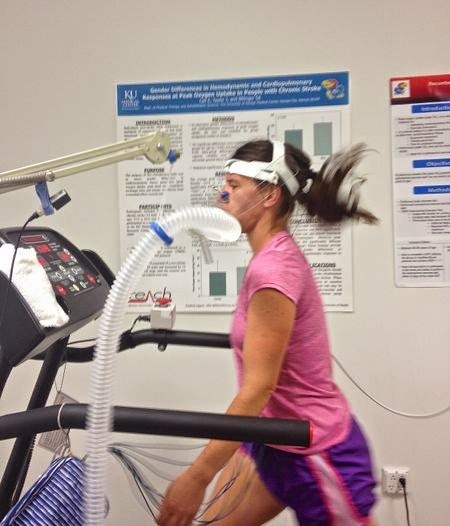 Then on the 3rd day I came in and did the VO2 max test on the treadmill. I assume they then compare the data. I felt silly asking to have my picture taken but apparently almost everyone who participates wants their picture taken. You can see why. They hook up about 10 electrodes all around your chest to monitor your heart. That's what all those wires are coming out of the bottom of my shirt. Then they fit you with head gear to help hold up the tube you have to breath through during the test. They clip your nose shut so they can collect data on all the air you breath out and a blood pressure cuff so they can take it 3 times during the test. I was told the whole test would take 10-15 minutes and would end either when I said to stop, when I hit my max and plateaued or you know had a heart attack or something, haha. It's more about incline than speed. You start with 3 minutes at walking up a small incline they then increase the incline and speed every 3 minutes. I switched from walking to a run at the 6 minute mark and the incline was crazy at the end. I went 12:27 and was like I'm done but he said he was about to cut it anyway since it looked like I had plateaued. I maxed at 49 which according to charts is excellent for a 35 year old women and puts me in about the 97th percentile of 30-39 year old women. Yes, i'm pleased with this.